Locomotive Transfer Table Chock - Blue Steel Co., Inc.
Our customers were using this old bolt down, clamp style chock below. They had to replace them frequently as the metal fatigued and the holding capacity was sub par. It had many unsafe drawbacks. The Old Bolt down style chock has numerous drawbacks. Chock bolts must be replaced often due to fatigue, reusing a torqued bolt is not recommended. The likely danger of a torqued bolt breaking due to over tightening. Chock components bend, reducing clamping strength. 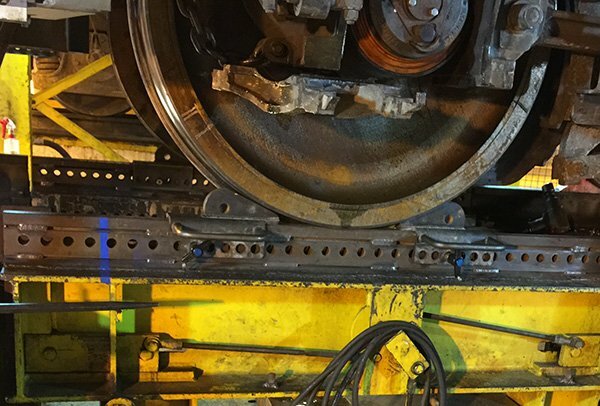 Equipment failure resulting can cause the accidental movement of the traction motor during removal or installation. 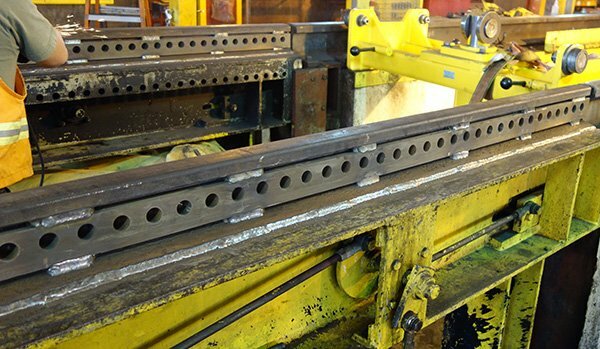 Blue Steel can supply your truck shop with the Locomotive Transfer Table Chock rails, and make Safe Work in your truck shop. Easy to use 100,000 PSI T-Handle Pin secures the chock through the rail, nothing here to come loose during the operation of the table. Chock slides in the horizontal direction on the rails for easy placement. Precision machined parts provide 1/4″ increments for pin placement, accommodating for locomotive spotting and wheel diameter variation. Safety First for the Locomotive Truck Shop!!! 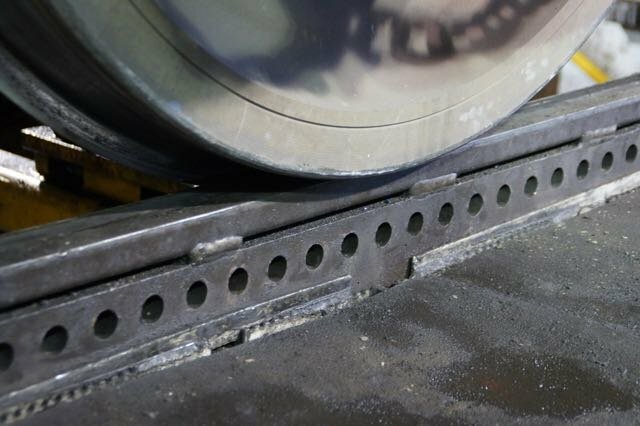 To inquire about our Locomotive Transfer Table Wheel Chock.